Casablanca vintage movie poster via Pinterest. For people of a certain generation, “Casablanca” is a name which instantly evokes passion, longing, and romance. 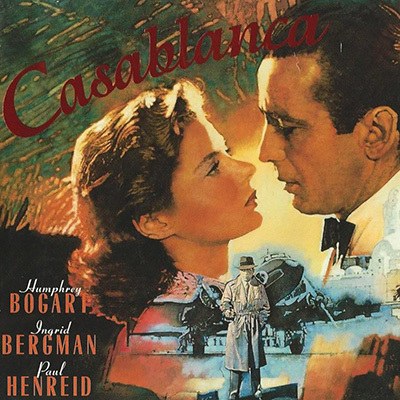 The famous Oscar-winning film starring Humphrey Bogart as “Rick” and the beautiful Ingrid Bergman as “Ilsa” was, on the surface, a war-time drama involving spies and Nazi resistance figures in Casablanca, Morocco, but it was ultimately a heartbreaking romance involving star-crossed lovers. “We’ll always have Paris,” Rick’s quiet words as he said goodbye to the woman he loved, a farewell full of sacrifice, tenderness, and yearning as she boarded a plan to leave, have become one of the most famous lines in movie history. Photo, left: Casablanca movie still. Photo, right: Oer-Wout Photography. Collage: my own. Well, you can knock me over with a feather! 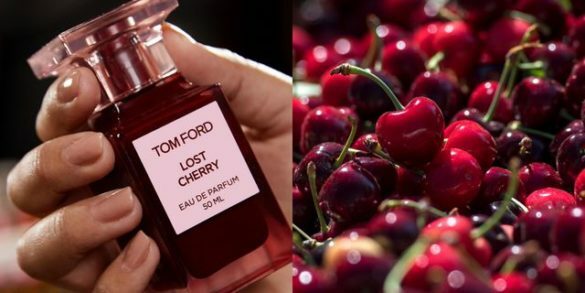 Against all odds and much to my surprise, I actually enjoyed Lost Cherry, the newest release from Tom Ford. I must admit, I’m quite flummoxed. I’m not one who is normally keen on gourmand fragrances and cherry is not particularly high on my list of favourite fruit notes in perfumery. Plus, the fragrance is hardly perfect as there are performance, drydown, and price issues but, nevertheless, here we are: I think Lost Cherry is a heck of a lot of fun to wear and I wouldn’t mind a small decant to wear occasionally during the dark, icy months ahead. Lost Cherry collage from Elle.com. Le Labo recently released its first new fragrance in three years, Tonka 25. It’s an eau de parfum that was created by Daphne Bugey and it’s available worldwide (as opposed to being part of the city-exclusives line of fragrances). Though I had high hopes for Tonka 25, I found it as dull as dishwater. There are certain aspects which I could see appealing to fans of a particular, specific genre of perfumery but, for me, it was about as memorable, distinctive, robust, flavorful, and interesting as Chef Boyardee canned spaghetti. The Koh-i-Noor, “mountain of light” in Persian, is one of the largest and most famous diamonds in the world, part of the British Crown Jewels, and a glittering focus of the opulent Queen Mary’s Crown. It is also the name of Areej Le Doré‘s latest parfum, a floral oriental with a heart of lush, indolic flowers, radiating white, yellow, and gold, against a velvety backdrop of golden amber, Mysore sandalwood, citrus, deer musk, and oud. Left: the Koh-i-Noor in the front cross of Queen Mary’s Crown. Source: Wikipedia. 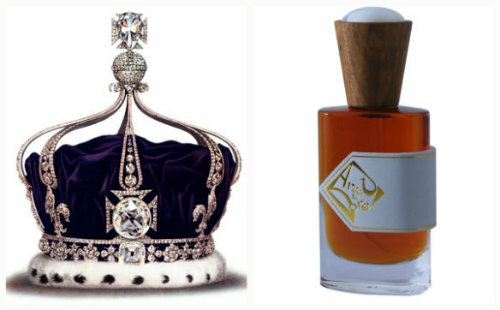 Right: Koh-i-Noor parfum. Source: Areej Le Doré. Collage: my own.